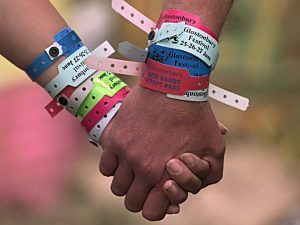 Over the past decade or so, wristbands have easily become the most popular way of managing admissions at sporting events, rallies, and music festivals. You could say they’re cool, hip, and trendy and in addition they are the perfect way of promoting a brand. However they didn’t start out this way and in actual fact, they had a different purpose altogether. Wearing a vulcanised rubber wristband back in the late 19th century probably wasn’t your or my idea of fun. Instead of wearing it as a sense of belonging or togetherness as one would associate it now, it was worn as a type of reminder to help a person break bad habits. Known as ‘simple conditioning’, every time the wearer caught themselves doing the very thing that they wanted to stop, they would pull the rubber band until it was taut and then let go of it until it hit the sensitive skin of the wrist, ouch! By causing mild discomfort the idea was that it made the person associate slight pain with the bad habit and the resulting ‘twang’ would hopefully dissuade them from breaking the habit again. Over the years, wearing rubberised wristbands with the sole purpose of breaking bad habits became more popular and over time someone came up with the idea of colouring them to distinguish their group of habit breakers from others. As such whole groups would wear same-colour a wristbands which represented a sense of identity and a sense of purpose. I wonder if they used to ‘twang’ themselves in unison too! In the 1980’s red ribbons were first worn as a symbol of solidarity for the fight against AIDS. This was loosely based on the yellow ribbons that were used to welcome home US serviceman. Such a devastating disease with no real treatment at the time, more than 100,000 were distributed as a sign of commitment to unite in the fight against HIV. Before long other charities wanted to introduce their own identity and someone recognised that rather than distributing ribbons that could easily get lost, a wristband made from rubberised gel could be worn discreetly if necessary. Hence the birth of the modern day wrist-band. Supervising and control of entry is one of the most difficult aspects of any concert where there are large gatherings of people. Thankfully here at MA Security services, we’re experts at it. If you are considering organising a concert or event (wristbands or not) then you might want to contact us for help. Give us a call on 1300 020 406 to find out more.